Preheat oven to 180°C/350°F and line a baking sheet with parchment paper. Wash eggplant and trim off the ends. Cut a thin slice off of one side to form a flat base for safe cutting, then cut into thick matchsticks. In a bowl, whisk together the egg, garlic powder, paprika, cumin, and salt. Add the breadcrumbs to a separate bowl. Dredge the eggplant matchsticks in the egg mixture and then in the breadcrumbs until fully coated. Spread out eggplant sticks on prepared baking sheet and transfer to preheated oven. Bake for approx. 15 min. at 180°C/350°F, or until golden brown. In the meantime, finely chop dill and mix with yogurt and lime juice. Season with sugar, salt, and pepper to taste. 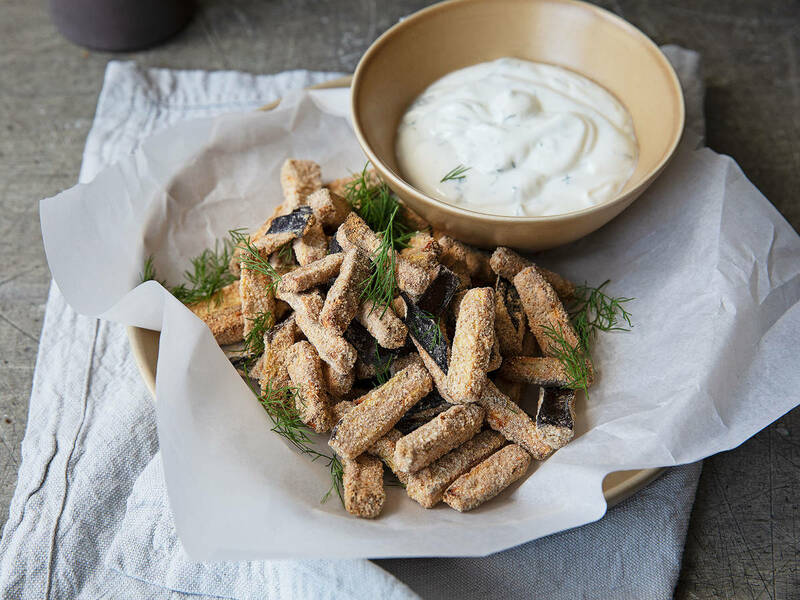 Serve eggplant fries with lime-dill dip. Enjoy!